It is mid March – so we are surrounded by green. 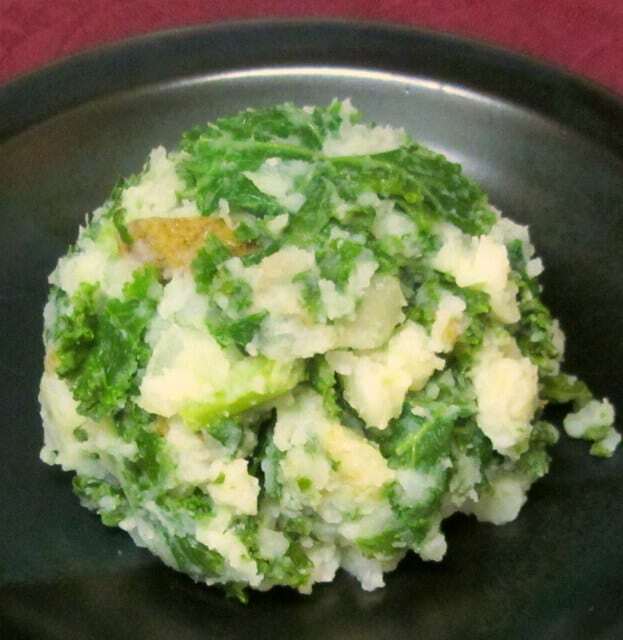 Green grass, green flower shoots – but also, for St. Patrick’s Day, green mint pies and green pancakes, and, so help me, green bagels… I thought it would be a nice change to give you a green dish that actually is a traditional Irish food – colcannon. 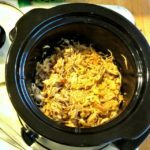 Like many traditional foods, you can vary the way you make it. I already mentioned different kinds of onion. Change the greens – cabbage is almost as traditional as kale, but you can certainly use other greens if you like – chard, mustard… (I’d steer clear of beet greens, for visual reasons.) 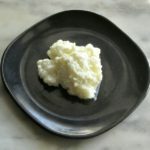 An Irish American friend whose family has been making it with what was available here for 3 generations doesn’t use the name – but once or twice a week serves frozen creamed spinach with instant mashed potatoes, because that’s what she’s eaten all her life. 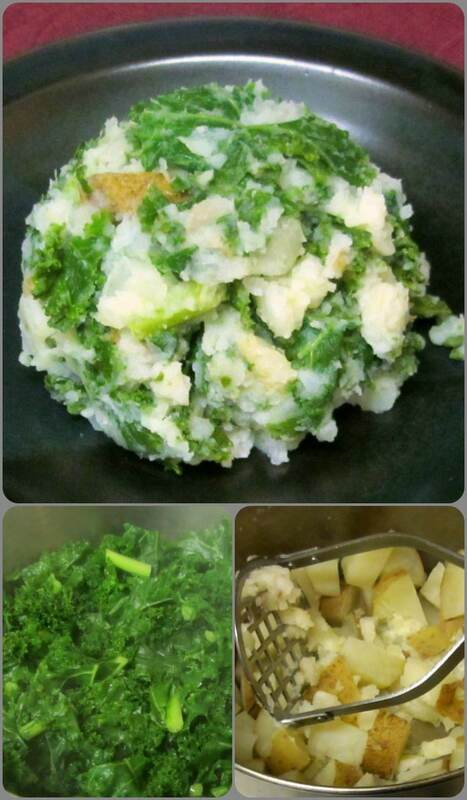 (I think we can do better than that…) It is a wonderful way to use leftovers – mash enough potatoes for two nights, then, the next day, saute an onion, add chopped leftover greens (perhaps in the form of my frozen “green muffins”) and mix in the potatoes. Sometimes it’s all mixed together in a cake, and then pan fried. And cook your kale. 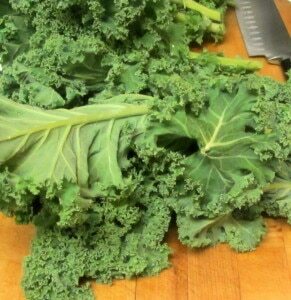 Now usually, I cook kale the same way I cook chard or other greens, with a saute and steam method. That works well for the tender kale you get in summer. 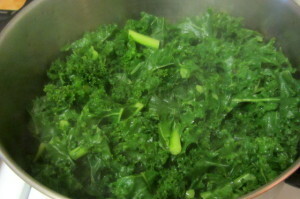 This, however, is the dense, tough curly kale – it needs a real simmer to tenderize it. I chopped it, washed it, and then filled a soup pot with it and added a couple of cups of water (the water does not have to cover the kale.) 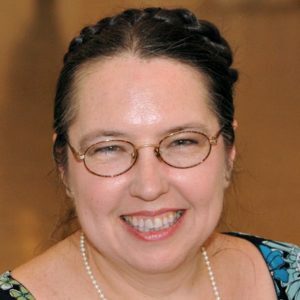 Not all the kale fit, which was fine – I covered the pot, brought it to a boil, and then, as the greens in the pot softened, I added the rest and stirred it down. Once it was all in, I covered and simmered for about 10 more minutes – check it periodically, as the time will vary. You need it tender, but I prefer it still a bright green. (Occasionally you’ll get a really tough bunch that won’t cook tender until the color has changed – I had some of that in November – so do check tenderness.) Once it is cooked, drain, cool, and chop finely. All that can be done in advance – and, as I said, leftovers work well. 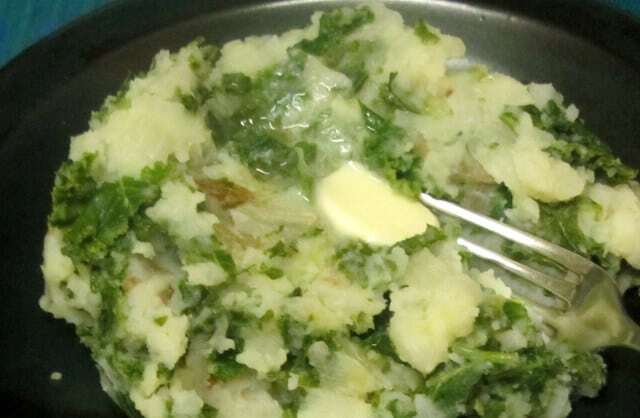 When you want to make your colcannon, take a large pan, and melt butter into it. (Yes, butter, not oil, for this one!) Chop your onion (or leek, or scallions…) and saute them in the butter until soft and golden. (Very briefly, if you’re using scallions… and use their greens, as well as the white parts.) Add the finely chopped kale, and saute it briefly while mixing it with the onion. (Or, if you are using a tender kale, saute the washed chopped kale with the onions as usual, cover, and steam until done.) Then add the potatoes, and stir around to mix, and heat through. Of course, serve it with butter. There you are. Warming and filling, easy, a great way to cook kale, no wonder it’s been a staple for generations! 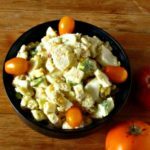 And for years, in my house – I’d make a meal of that with cheese and egg, when I was single (especially when I was mostly vegetarian,) and feel well fed. Writing about it reminds me to make it more often – we eat so many greens, and this is such a good variation. 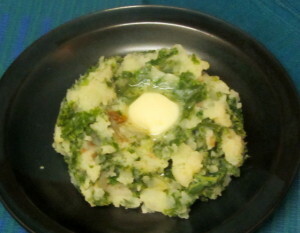 Colcannon - a traditional Irish recipe. 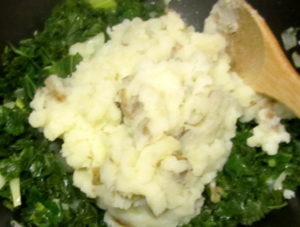 Combine kale and mashed potatoes for a delicious side dish - and don't forget the butter! 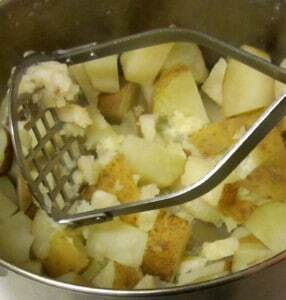 Scrub potatoes, and cut in small pieces. Place in a pot of water, bring to a boil, and simmer until soft. Drain. 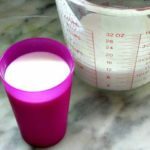 Mash with the milk. Chop the cooked kale into small pieces. Melt the butter in a large pan. Saute the onion in it until soft and turning golden. Add the kale, and stir. Add the mashed potatoes, stir to combine well, and heat through, if needed. Ooooh sounds lovely, and how perfect for today! I had never heard of colcannon before, but I wish I had, it sounds like a great combination side dish that steve and I would both love! Thanks so much for joining us for meatless monday! Have a wonderful day! Thank you! 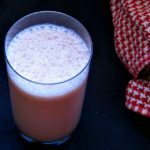 It really is useful - takes two basic foods we eat all the time, and combines them into something so much more interesting. I have never heard of or seen this dish! I'm intrigued. 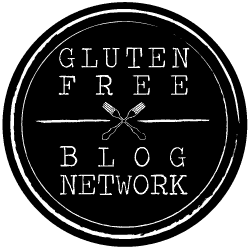 Thanks for linking up with us today for Meatless Monday! Yum! This looks delicious! You had me at kale and potatoes.